Since the media either focused its attention on Obama’s blunder in Afghanistan or on the new bureaucratic agreement on commerce in the Pacific, a most important (and joyful) news probably slipped your attention. Indeed, for the first time in history, extreme poverty now affect less than 10 percent of the population. And that even happened even thought the World Bank changed the definition – it’s now living with $1.90/day or less, whereas it used to be $1.25. Who should we thank for this apparent miracle? Labor unions? No, not really. They are greatly responsible for workers’ impoverishment since they can’t work. It’s Economics 101: when the wage floor level from collective bargaining is higher than what the market wants to pay, there is a surplus of workers, i.e. unemployment. Unions can therefore congratulate themselves for creating structural unemployment but also astronomical public spending thanks to their outrageously generous benefits. And let’s not forget about their vile pretention to others’ money, which discourages job creation. Governments? Even less. Not only are they responsible for every single economic crises of the past 100 years, they are also responsible for creating poverty. From regulations that keep food carts 800 feet away from brick-and-mortar restaurants to others that make hairdraiders follow 2,000 hours of classes completely unrelated to their art, to supply management that it expensive to low-income households or to taxes that discourage work, they have nothing to do with the above-mentioned achievement. But who, then? Who (or what) was able to get humanity out of its real state of nature: naked, without resources and vulnerable to elements? It can only be the only economical and social system that was able to get humanity out of its abject misery that characterized it until the Industrial Revolution: capitalism (or rather, the bits and pieces of it that survived). Indeed, before 1750 Europe looked a lot like Anthem: everyone is born into a cast from which change is nearly impossible. And to make sure of it, many governments such as in England made apprenticeship laws where you could start working only after seven yars. Adam Smith vehemently denounced these awful regulations. Then, without warning a Revolution started about 260 years. With the invention of a “simple” machine, and thanks to conditions that favor the accumulation of capital, it was now possible to obtain very inexpensively (and at a relatively good quality) products that either had to be self-produced or bought of licensed merchants at very high prices. It was even possible to get out of begging, prostitution, famine and/or back-breaking agriculture and earn a fortune (for the time). No, I would certainly not want to work in a manufacture today. But confronted with the choices people had at the time, I would almost have certainly gone there without hesitation. What is the link with capitalism? So far, this system is the only one that has allowed the human mind to flourish to its full potential. Hadn’t the English government been influenced by the Enlightenment, it would have given in to Luddites and ordered that machines be destroyed. Had unions been in charge, they would have stopped the technological progression and demanded all sorts of irrealistic conditions (for the time). Workers themselves were opposed to shorter work days, as Marx himself reported in his infamous Das Kapital. It can still be seen nowadays in Third-World countries. People are rushing towards so-called sweatshops in order to do away with their poverty. With wages 5 to 10 times higher than what they would get elsewhere, it is indeed their best bet for a life where they can life autonomously. In other words, unlike the newspeak liberal useful idiots, take a moment to thank capitalism to have gotten you and five billion humans out of the abject poverty and misery that characterized humanity for two millions years. Have some thoughts for the great minds that it is in our self-interest to cooperate with others, but also that wealth isn’t a fixed value; it can be expanded with industry. 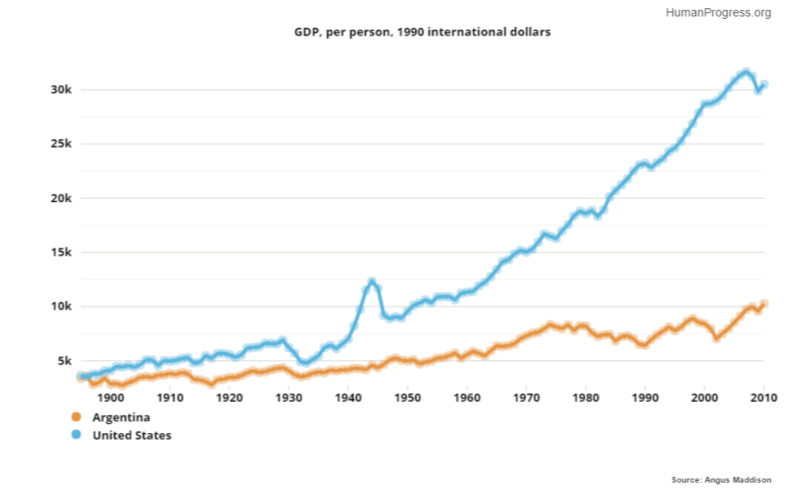 For those that still doubt the benefits of free markets, please compare the US and Argentina in the past 100 years. Also tell me, notwithstanding Tetris, which original invention from beyond the Iron Curtain survived its fall. But if, despite an unberable burden of proof showing the advantages of free markets, you still decide to whine about it, you are free to do so. This is still a (relatively) free country after all. However, in order to make you happy I would invite you to live at the bottom of a forest and live like a caveman. Now you will be happy without capitalism… if you survive. Thanks for writing – such a critical point that often gets lost – capitalism has radically improved the lot of our species!